Last night was my annual Christmas Winers meeting (if you don't remember, Winers is the name of a wine club my friend Renee and I started for our girlfriends). Christmas Winers has always been extra fun, because we do a white elephant gift exchange. 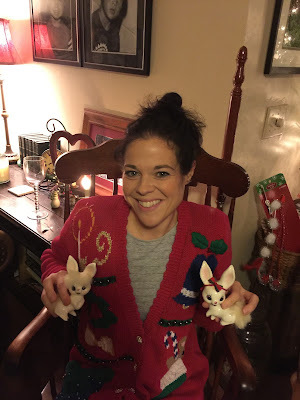 Yesterday, my friend Melissa hosted, and made the theme an "Ugly Christmas Sweaters" party. I went to the thrift store and bought the only Christmas sweater I could find--thankfully, it was pretty hideous, even if it was ginormous on me. It was fun to see my friends--it's been a while since anyone has held a Winers meeting (we used to do it every month, but now it's been just a couple of times a year). Unfortunately, I couldn't drink any wine! This is so odd, but I have turned into a total lightweight. The recent weight loss, combined with the fact that I usually only drink once a week or so, has lowered my tolerance so much that even one glass of wine would have been too much to responsibly drive home. Jerry had to get up early to work today, otherwise I could have had him pick me up. But anyway, I was happy to be able to chat with my friends! but we didn't have anyone to take a group photo, so we did two separate ones. The white elephant gift exchange is always fun. We draw numbers to determine the order we choose gifts. The first person chooses a gift and opens it, and then the second person can either steal that one away, or open a new one. Then the third person can steal one that's already opened, or open a new one. And so on. Then, at the end, the first person can steal any of the gifts. Renee ended up with my gift, which was this wine glass that says "I love my cat" on it (and Renee is actually allergic to cats, so she doesn't have any!). I also threw in a wine trivia game. The last person to take a gift ended up stealing mine, so I ended up being the last person to choose. I could either open the last gift, or I could steal someone else's. I decided to open the last one, and I nearly died when I saw what it was. First, the back story: Several years ago (I believe 2009?) 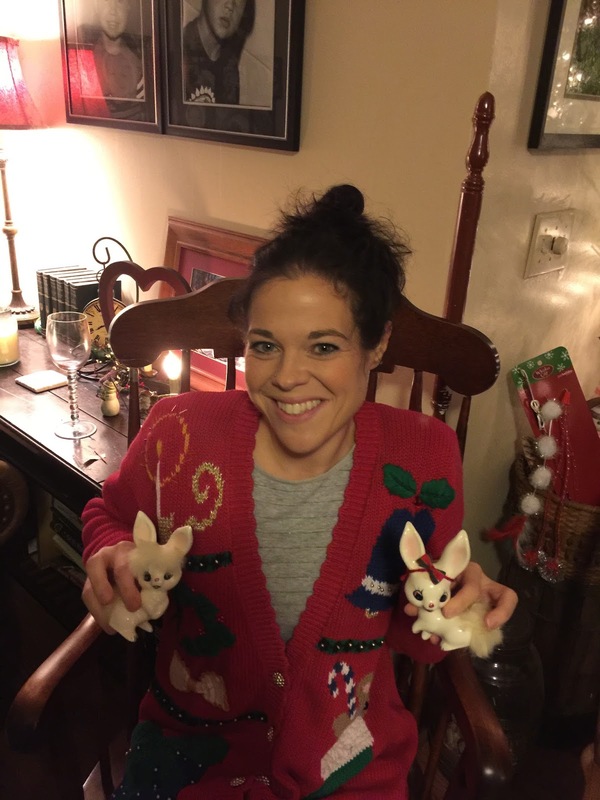 I wound up opening this gift of some ceramic bunnies. 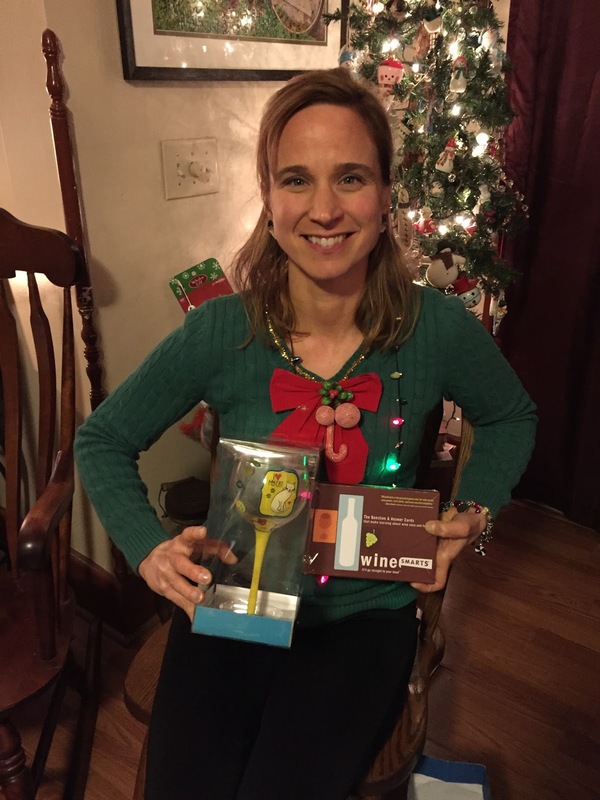 Everyone cracked up at how perfect a white elephant gift they were, and I decided to hold onto them for a year and then regift them at the next Christmas Winers. Somehow, I managed to get them AGAIN, so they spent another year at my house. Eventually, I gifted them away, but they still made an appearance each year at Christmas Winers! Why yes, I do have shoulder pads in my sweater! Now the bunnies will be taking up residence in the Foster household until next Christmas Winers ;) Super fun Winers! I set the treadmill at 6.5 mph, and left it there the entire run. Almost immediately, I started getting those weird ab muscle cramps again. I have no idea what those are from! But I have realized that when I breathe deeply, they ease up, so I spent all of today's run breathing in for four steps, and out for three steps. My legs and lungs felt great, but the ab cramps made the whole thing a little uncomfortable. I did earn two new badges on Smashrun, though! I'm going to try and earn the Shortest Day badge on Monday... to get it, you have to run during sunrise and sunset on the shortest day of the year (Winter Solstice). The runs have to start prior to sunrise and sunset, and finish after sunrise and sunset. It only happens once a year, so I am looking forward to doing it! Any of my fellow Smashrunners going to go for it? Don't forget to send in your Motivational Monday submissions this weekend! I remember reading your blogs just before I started in 2012--I have regained some of my weight but I'm still much smaller then what I used to be. I think winter solstice is Tuesday. I would hate for u to do ur runs on the wrong day. Third time is the charm. These bunnies just keep finding their way to you! 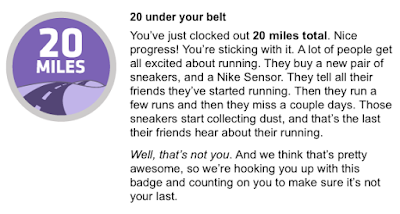 I signed up for Smashrun after your blog about it! This sounds like SO MUCH FUN!!! As my friends and I have been finding it harder and harder to get together (everyone has small children, etc right now), this sounds like such a great way to do that.